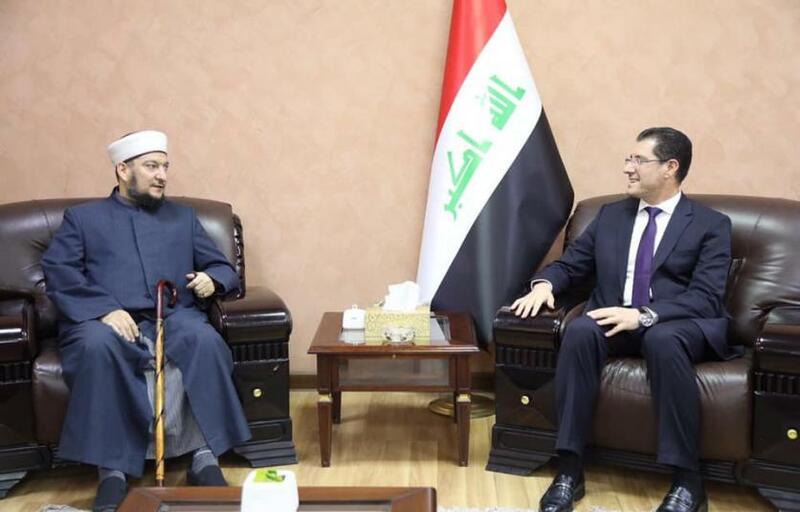 The Minister of Planning, Dr. Nouri Sabah al-Dulaimi, received on Wednesday a delegation from the Iraqi Juristic Society headed by Dr. Abdulwahab al-Samarrai. During the meeting, he discussed the religious reference role of the complex at the national level and its role in achieving the goals of sustainable development. Dr. Nouri al-Dulaimi, during the meeting, praised the effective role of the religious authority in the Iraqi jurisprudence complex, the contribution of the influential religious institution in its various schools of jurisprudence in Iraq to the unity of the national class and the support of government bodies to carry out their duties towards the homeland and the citizen. In turn, the delegation of the Iraqi Fiqh Academy expressed its sincere appreciation for the efforts of the Ministry of Planning, praising the vision of the Ministry in the development and sustainable development of Iraq 2030, while the guest delegation not to save any effort to assist government agencies in the performance of its functions.